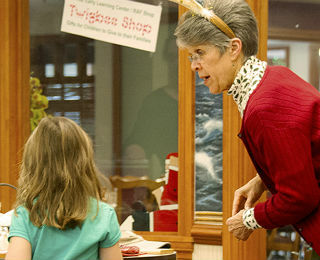 Volunteering is a way of life at Kendal at Oberlin. Collectively, residents logged more than 48,000 hours in 2014. Residents are active and engaged in volunteer opportunities at Kendal, and in the larger community as well. What Does Serving the Community Mean at Kendal? Ways to serve the resident-driven Kendal community are plentiful. Here are just a few examples of the opportunities Kendal residents have to shape the lifestyle of their community. KORA Council. The Kendal at Oberlin Residents Association (KORA), is the driving force behind many volunteer and service opportunities. In fact, one of the first opportunities to serve, available to all residents if elected, is the opportunity to serve on one of the KORA committees. Care and Nurturing Committee. Provides personal service and support for residents going through a difficult time. Buddy System. Encourages residents in cottages or apartments, who live alone, to choose a buddy so that they can check up on each other. The goal is to ensure that every resident is checked on at least one time each day. Medical Companions. Accompany residents who must go off-site for medical purposes (studies, consultations and procedures). The Kendal Resale Shop. Staffed entirely by volunteers, the Resale Shop accepts donated clothing, furniture, household items, jewelry, etc. from residents who have moved from larger to smaller spaces. All proceeds from the Kendal Resale Shop support the Resident Assistance Fund, assuring that services will continue for residents who may outlive their financial resources. Supporting Friends. Help residents of Stephens Care Center and their families by offering companionship, aid and social interaction. Twice a month, residents help the hungry and support Second Harvest. They pack food at the warehouse where donated foods for Lorain county residents are stored, weighing cans, boxes and other packages for distribution. In serving the larger community in a wide variety of ways, Kendal residents develop deeper bonds with one another, while also showing compassion and care for the needs of the greater community. What volunteer activities do you enjoy? Please share your experience and how it is rewarding below.